One specificity of the implementation is that it will materialize one and only one instance of a constant per basic block, thus enabling reuse of that constant within that block. Moreover, it only materializes constants in blocks where they are used. 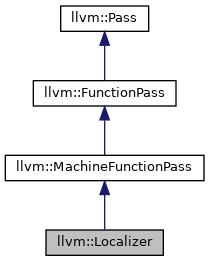 PHI uses are considered happening at the end of the related predecessor. Definition at line 38 of file Localizer.h. Definition at line 46 of file Localizer.cpp. 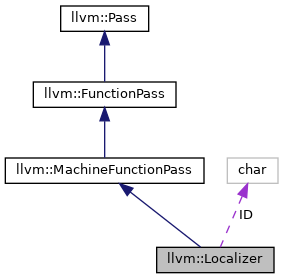 References llvm::tgtok::Def, llvm::MachineFunctionPass::getAnalysisUsage(), llvm::MachineInstr::getOperand(), llvm::MachineInstr::getOperandNo(), llvm::MachineOperand::getParent(), llvm::MachineInstr::getParent(), llvm::getSelectionDAGFallbackAnalysisUsage(), and llvm::MachineInstr::isPHI(). Definition at line 63 of file Localizer.h. Definition at line 65 of file Localizer.h. References getAnalysisUsage(), llvm::MachineFunctionProperties::IsSSA, llvm::MachineFunctionProperties::Legalized, llvm::MachineFunctionProperties::RegBankSelected, runOnMachineFunction(), and llvm::MachineFunctionProperties::set(). Definition at line 60 of file Localizer.cpp. References assert(), llvm::MachineBasicBlock::begin(), llvm::SmallPtrSetImpl< PtrType >::count(), llvm::MachineRegisterInfo::createGenericVirtualRegister(), llvm::dbgs(), llvm::DenseMapBase< DenseMap< KeyT, ValueT, KeyInfoT, BucketT >, KeyT, ValueT, KeyInfoT, BucketT >::end(), llvm::MachineFunctionProperties::FailedISel, llvm::DenseMapBase< DenseMap< KeyT, ValueT, KeyInfoT, BucketT >, KeyT, ValueT, KeyInfoT, BucketT >::find(), llvm::MachineInstr::getDesc(), llvm::MachineFunction::getName(), llvm::MCInstrDesc::getNumDefs(), llvm::MachineInstr::getOperand(), llvm::MachineOperand::getParent(), llvm::MachineFunction::getProperties(), llvm::MachineOperand::getReg(), llvm::MachineRegisterInfo::getRegClassOrRegBank(), llvm::MachineRegisterInfo::getType(), llvm::MachineFunctionProperties::hasProperty(), llvm::DenseMapBase< DenseMap< KeyT, ValueT, KeyInfoT, BucketT >, KeyT, ValueT, KeyInfoT, BucketT >::insert(), llvm::SmallPtrSetImpl< PtrType >::insert(), llvm::MachineBasicBlock::insert(), LLVM_DEBUG, llvm::printReg(), Reg, llvm::MachineOperand::setReg(), llvm::MachineRegisterInfo::setRegClassOrRegBank(), llvm::MachineBasicBlock::SkipPHIsAndLabels(), llvm::MachineRegisterInfo::use_begin(), and llvm::MachineRegisterInfo::use_end(). Definition at line 40 of file Localizer.h.